The Pleiades, also known as ‘The Seven Sisters’, is the nearest star cluster to earth situated between 434 and 446 light years away. The cluster is the source of the names of each of the sisters in The Seven Sisters series. 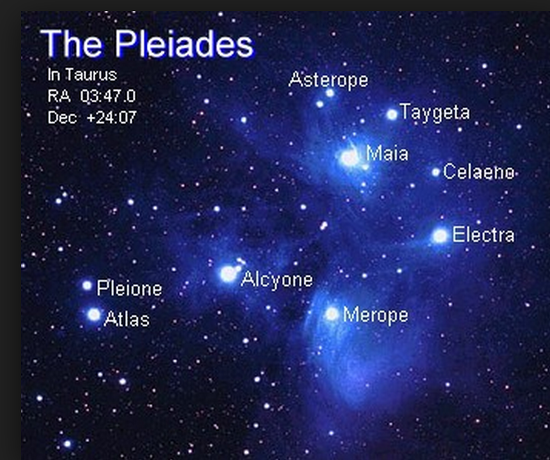 The Pleiades is positioned near the shoulder of Taurus (The Bull), the larger constellation to the right of Orion’s Belt. Each of the stars is over 100 times brighter than our sun, and the human eye, from any country on the globe, can see at least six stars, with a seventh which varies in brightness and is not always visible – the reason for this fluctuation in brightness is still unknown. Some people with exceptional eyesight claim to be able to see up to 20 stars in the cluster without the aid of a telescope. There are thought to be as many as 1000 stars in the cluster, the core of which spans 8 light years in diameter. The cluster is dominated by ‘hot blue stars’ which have formed within the past 100 million years and astronomers believe that the cluster will survive for another 250 million years.